"We're all from these different cultures now really," she explains, "but there are so many things that we're so in line with, no matter where you are from, or whether you are left or right. "So that's kind of my tune that represents how I'm feeling and how a lot of people I think are feeling about what's going on with the Brexit thing," adds Connie, in the type of plain-speak that has arguably been missing over at Whitehall. The track - which comes with a language warning - sees the singer reel off a melodious list of the things that, to her mind, make up our shared national identity: Drinking tea (with too many sugars in) while reading the newspaper, and moaning about other people moaning about politicians, to name but two. "It was originally inspired as I was with my friend [and collaborator] Dave Acumu and he was laughing saying: 'Look at you with your Guardian and your cup of tea! You're so British. '"I was like 'Oh my God, that is so British!' I literally wrote it down, then I went in with this guy, Paul White, and wrote the tune and I was just really trying to get into all the really stereotypical things that we see British people do or say as a group. "I felt like that was my one tune that was documenting the times a little bit." Connie herself - as she admits in the song's first verse - did not vote in the European Union referendum back in 2016, but she was not alone.For one reason or another, 27.8% of the UK electorate did not register either a 'leave' or 'remain' tick in the boxes that would ultimately determine 'the will of the people'. In lieu of an actual vote then, Bloody British Me - loaded with Connie's own contradictions, frustrations and idiosyncrasies - is, she declares: "Kind of my internal protest, whatever way you're feeling about it. "The lyrics read: Bloody British Me / Slave to the country's dim democracy / Yet I didn't vote cause I'm so [flipping] lazy...... Stuck in the mud / Can't move forward / What's that"And it's like, 'When is it gonna break through?' And when is a leader gonna come through and really implement some change? "The character in the song has contradictions; venting about something - venting about negativity. But by doing that you're being negative yourself. "I wanted the song to say that." The BBC Biggest Weekend performer spent her teens as a real indie kid, listening to bands like the influential Arctic Monkeys with her white school friends, while outside of the classroom she was introduced to hip hop and R&B by a different group of mixed race and black friends.Punk entered the equation via her step-dad and reggae thanks to her grandad.Now, her rich cultural heritage comes to the fore throughout her first full-length record - "my little life's work" as she calls it - which is chock-full of ingredients from the worlds of pop, indie rock 'n' roll, rap, soul, jazz and even trip hop, all cooked together to make a quirky new dish. 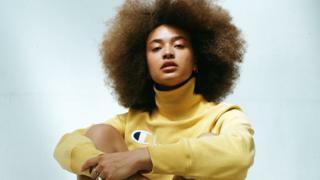 Aside from notions of modern Britishness, lyrically, Connie - whose real name is Constance Power - tackles topics like her own mental health and drugs ("[i]Here you go, happy pills / Now you're looking more yourself") and deeply personal relationships in a brutally honest way ("You destroyed a part of my mind"). "I feel like I managed to talk about everything I wanted to talk about - from my experience of British culture and being a young person growing up, to individual things that have happened to me," says the former ballet and musical theatre student. "I wanted to be super raw about it in case anyone else was experiencing the same thing - then they have something to relate to." "When I first started making music I knew that I was a long way away from making the sound that I wanted to make," she goes on, "and I was open to that, open to experimenting and even putting my experiments out to the world. "I just thought 'it's fine, it's gonna take me a while.' So it's probably a shock that it actually sounds like all the stuff that I thought it would've taken me a lot longer to grasp. "Jim Abbiss (Adele, Arctic Monkeys) produced the LP, which was written alongside the likes of Mura Masa, Alfa Mist, Blue Daisy and the aforementioned Acumu.It begins with a piano-driven cover of the 1978 Jam track from which the album takes its name but by the end of her version, Connie's Amy Winehouse-esque off-kilter soul vocals have "reshaped the identity" of the English Rose into something else entirely.A bold move, perhaps, to launch your new life on record? "Yeah, especially for Jam fans!" she laughs, "but I like to think that I put my own spin on it." Her management, she tells me, sent a copy to the song's writer Paul Weller, who apparently likes it, but Connie - now grinning from ear to ear - seems reluctant to fully believe it.Another famous fan for sure is fellow Watfordian, Elton John, who played one of her early album tracks, Let Go, on his Beats 1 radio show.On the album cover Connie is seen sporting a 1995 [the year she was born] shirt belonging to her local Premier League club, which Sir Elt' used to own.She might have moved to nearby London at 16 to study dance but after the Rocket Man and boxing champ, Anthony Joshua, Connie is fast becoming known as Watford's next big player in town. "I feel like what AJ has done for my generation of young kids is just give them a platform to be like, 'Oh, we can actually work hard at something and achieve mad dreams. "So I'd like be part of that movement. "I might have to send the album to him and see what he thinks..."Connie will perform the new material in front of her British compatriots for the first time on tour in May, where she'll stop off at The Great Escape festival.Whether we'll all still be 'stuck in the mud' of Brexit by then or not, remains to be seen.English Rose is out now. » Rappers and songwriters: Is it OK to get help writing songs? » Is Saudi money becoming radioactive?